Benjamin R. Young is a Postdoctoral Fellow at the U.S Naval War College (The views expressed in this article are the author’s alone and do not reflect the viewpoints of the U.S Naval War College, the U.S Department of Defense, or the U.S government). 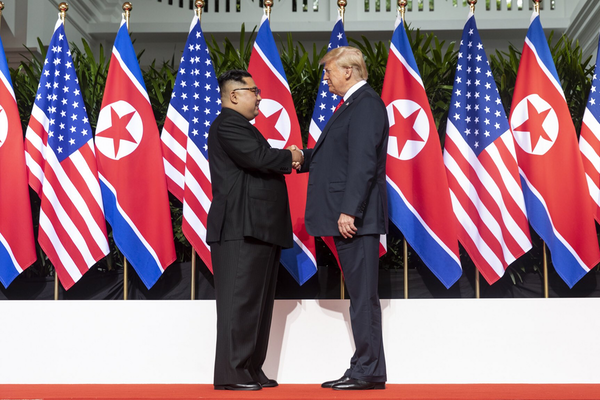 The second summit between U.S President Donald Trump and North Korean leader Kim Jong Un in Hanoi failed due to a relatively unknown quantity: North Korea’s domestic politics. Despite more than sixty years since the armistice declaring the end of the Korean War, the U.S and North Korea seemed closer to peace than ever before. As evidenced in the case of post-World War Two Germany and Japan, and communist Vietnam, U.S is no stranger to making former enemies into friends. However, few have asked how this thaw in hostilities affects North Korea’s messaging to its own people. It is too politically risky for Kim Jong Un’s regime to have friendly relations with Washington. As an autocratic regime, North Korea remains politically stable by limiting the flow of information into and out of the country. This information blockade has allowed the Kim family regime to stay in power longer than the Soviet Union ever existed. North Korean propaganda has strategically positioned the “U.S imperialist bastards” as the forever enemy of the Korean people since 1950. Propaganda posters feature North Korean missiles hitting the U.S capitol and hook-noosed U.S soldiers brutally massacring Korean peasants. There is a museum in Sinchon, North Korea dedicated to U.S atrocities during the Korean War. Despite the fact that many of these atrocities are made up by the North Korean propaganda apparatus, schoolchildren take regular trips to this museum for political education purposes. At festivals, shooting games feature portraits of U.S soldiers as targets and children practice bayonetting U.S soldiers at recess. The U.S boogeyman serves as a mobilizing force for the Kim family regime and inspires the North Korean people to endure harsh living conditions for the good of the nation. The North Korean people boast about its nuclear program and ability to defend themselves against the much stronger and larger U.S military. As North Korean propaganda explains, once the U.S leaves the Korean peninsula, the golden era of Korea will begin. Peaceful reunification with the South and a strong economy awaits those who now sacrifice for the fatherland. However, can the Kim family regime continue its brutal ways without the U.S boogeyman? As 19th century military theorist Carl von Clausewitz explains, “primordial violence, hatred, and enmity” are a “blind natural force” in conflict and primarily motivates the people. Take this hatred away and what does a militaristic state such as North Korea have left to mobilize its people? The manufactured fear of a U.S invasion has left North Korea in a near-warlike state for decades and permitted the hereditary dictatorship of the Kim family. This siege mentality and anti-American sentiment will not vanish once Trump and Kim sign communiqués. It is too politically dangerous for the North Korean leadership. With more peaceful relations between Washington and Pyongyang, a lifting of sanctions and an increase in living standards for the North Korean people would likely occur. This would most likely boost domestic support for the Kim family regime. However, the information blockade and authoritarianism of North Korea’s political system would continue. In the future, who does Pyongyang then blame for its troubles? Recently, there have been signs in Pyongyang that anti-American propaganda is fading away. Much of this seems to be a spectacle for foreign journalists and tourists visiting the North Korean capital city. The regime cannot wholly remove anti-Americanism from the national consciousness without the fear of domestic instability. Once the U.S boogeyman is gone, the people’s passions and grievances now turn towards the North Korean government that has kept its people impoverished and literally in the dark for the last several decades. The North Korean leadership cannot have that. While friendlier U.S- North Korea relations are less dangerous for the whole world, the autocratic nature of the Kim family regime nor its many human rights abuses should be forgotten. As long as the Kim family regime remains in power, anti-Americanism and human rights violations will continue north of the DMZ. It is the only path North Korea’s leadership knows and can permit. Rapprochement with the United States is too politically dangerous for Kim Jong Un’s regime.